More than a third of people say they come up against discrimination because of their mental ill health on a weekly or monthly basis, according to a survey. The survey of almost 5,000 people with mental health problems by anti-stigma campaigning group Time to Change found that 34% said they come up against stigma and discrimination on a monthly or weekly basis. One in 10 say they face it every day. But there are signs that public attitudes have started to improve, with 61% of people saying they now find it easier to talk about their mental illness compared to previous years. 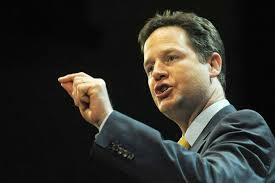 The survey results were published on the day that Deputy Prime Minister Nick Clegg highlighted the level of discrimination that people with mental ill health still face. “We’re still not comfortable talking about mental health,” he said. “Just imagine yourself stood at the school gates, chatting to other parents. Almost all of us would be fine with mentioning a relative with diabetes, or a family friend undergoing treatment for a broken arm or leg. But, if a loved one was struggling with a mental health problem, would you have the same conversation? For most people, probably not. • 61% have experienced stigma and discrimination from friends and in their social life. Sue Baker, director of Time to Change, said: “These new figures show that stigma and discrimination are still life limiting and for some people, who feel they can’t ever talk about mental health, life threatening. The new findings are released in the run up to the first national Time to Talk Day being held on February 6, which aims to spark a million conversations about mental health.